Much has been written over the years about former Maple Leaf great Dave Keon and his seemingly non-existent relationship with the Leaf organization. When it was announced yesterday that Keon would be part of the next “Legends Row” ceremony this coming fall (with other Leaf greats Turk Broda and Tim Horton), I was asked by Alec Brownscombe and Declan Kerin from the outstanding Maple Leaf Hot Stove web site if I had the time to write a piece, reflecting on my memories of Keon. I was only too glad to to do so. We all have our own personal memories of our favourite teams, players and special hockey moments. Yours will no doubt be different than mine when it comes to Keon—or any other player. But part of the fun of being a fan is that we treasure these personal memories for as long as we can—at least until our memory bank begins to sputter a bit, which happens to me fairly regularly these days. I could (and so could many VLM readers of my “vintage”!) write a great deal more about Keon—and I have here in the past. The picture on the right is an old newspaper photo from March of 1963. I’ve kept this picture ever since. 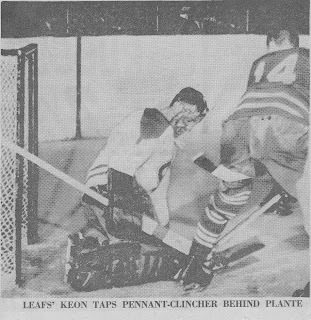 It shows Keon at the edge of Montreal netminder Jacque Plante’s crease, knocking in a game-tying goal with less than 10 seconds on the clock in a game at Maple leaf Gardens. Why is this photo such a fond memory for me? Well, that goal, on a late March night in Toronto, gave the Leafs a 3-3 tie in that game. And the single point in the standings on that Wednesday evening (I believe it was the third last regular season game of the 1962-’63 season), ensured the Maple leafs would finish the regular season that year in first place—something they had not accomplished in a long time, and haven’t been able to manage since. The memory stands out because Keon, while much more than simply an offensive player, did earn a reputation for scoring big goals at key moments, including during the playoffs. That was just one of the big ones. I hope you enjoy the story on the Maple Leaf Hot Stove site. And please share any memories here at VLM that you may have of one of the finest Leafs of all time. Do yourself a favour and read Michael's complete Keon article on MLHS. Excellent read!!! That game was the second straight time it ended 3-3 between Toronto and Montreal in 62/63. The tying goal by Keon was @ 19:52 of the third with Don Simmons pulled. Coincidentally, in the 3-3 tie less than a week earlier (March 14th), Keon also scored the tying goal in the third, 47 seconds in (And just 34 seconds after Ralph Backstrom's 20th made it 3-2). Right there in Montreal! Thanks for that, Scott- good stuff! Excellent post on MLHS on very deserving player. Turns out Dave Keon & I are same age. Because of this I saw him 'live' more in Junior Hockey (Hamilton Forum when played for St. Mike's) than I ever did at MLG, and Black & White TV was not the same when watching Keon ply his trade. I was going to school in Waterloo in 1960 and saw Keon trying out with KW Dutchman (he was 19-20) to play in Olympics. He was certainly good enough to be on that team, but I suspect age worked against him (remember the level of hockey played in senior OHA at that time was high, and their may have been resentment of junior making the team). The key thing I remember from that game, was that these much bigger, more experienced players despite their best efforts to crush him, failed spectacularly. It was like they were trying to catch up to smoke. This was a skill he brought to the NHL for so many years. Having lived in Toronto for many years, it is not hard to believe that the jailbird, Harold Ballard did not jerk around Keon many times in many ways. It looks like a new regime is in place, and it is good to see that Keon is getting the recognition he deserves, and he may as well enjoy it while he can. Michael, I continue to visit VLM to check for your latest post...you must have created an addiction. Glad you stopped by today and shared your memories, Ralph (RLMcC)- we're on the same page with regard to Keon. Just a tremendous player, who was a hero to many young Leaf fans in the early 1960s. Dave Keon was one of my heroes growing up. I watched him win 4 Cups with the Leafs. It is so long ago now that my memory of actual plays he made are a little fuzzy so mainly I have this memory of him being my favourite player and better than anybody on the Habs. The important memory is four Cups with Keon the key player in all four of them. I teared up when I heard he was finally making his peace with the Leafs and accepting the bronze statue which will honour him forever. I'm pretty happy about this - now if the Leafs win a Cup in a few years - and it will happen - imagine Dave Keon on a ceremonial face off with the captain of the Stanley Cup Champion Leafs. I really have a feeling this will happen now! You're so right, Alton- Keon was such an instrumental part of the Leaf success in the 1960s. It would be wonderful if he could really be - and feel - a part of the organization going forward. Keon was my favourite player when I was a kid. Wasn't he one of the last players to use a straight stick? That would account for his phenomenal backhand! Hi Mike- good to hear from you. Yes, to the best of my recollection, Keon always (right to the end of his career) used a straight stick, even as so many in the NHL were using at least a moderately bent blade. Wonderful posts both here and on MLHS. I so wish my Dad was still here to enjoy your site. Keon remained my Dad's favourite player throughout his hockey career. I don't think he felt anyone else ever came close. It too bad that most fans now never saw him play, but there are still some of us that remember. I hope the fans make a big noise for him on Saturday night. He deserves it. Thank you for the kind words, Colleen. Watching hockey with our Dad was, for many of us, one of the early life joys we experienced. I agree- it would be so nice to see Dave receive a warm reception when his name is called! I enjoyed both your articles on Davey, Michael... Keon was my first 'favourite player' before his departure 'tore my young heart out' (until Darryl Sittler arose to stitch it back in place)! One play is forever etched in my memory (though I don't remember the opponent), Dave was at the far edge of the opposition crease when a puck was sent toward Keon about 'eye high' - he adroitly corralled and dropped the puck at his feet, exactly where needed to deftly backhand the puck into the net. I marveled at his skill level amongst so many inferior talents. I also loved his skating (with the little skip step that so often punctuated his progress). He was such an exceptional talent and I wish I'd seen him during the cup runs in the 60's. So pleased that he has welcomed the opportunity to be honoured as part of the all-time bronzed team. I wonder if it was just my sound reception (that seemed off for the whole game), but the crowd reaction seemed kind of subdued when I was expecting an extended ovation... perhaps it's just been a bit too long (with too few of the 'old faithful' in the stands anymore). Nevertheless, it was a good tribute (and I was glad to see Horton go through at the same time - Dad was a D-man, so always like Timmy - before that meant a coffee or donut)! That "skip step" was a unique Keon trait, for sure, InTimeFor62. And it's just good that he is now a more formally recognized part of the Leaf legacy. I agree that the reception was modest. But I guess that's always a challenge in these events. Most of the people in the building are there because they care about the game that night, understandably. They never saw a particular player play- or may even know precious little about them or what they meant to the organization. As I've said before, I wish people who actually were fortunate enough to see guys like Keon and other greats play back in the day would have an opportunity on a non-game day/night to celebrate with an individual that meant so much to us. Horton and Broda are tremendously worthy as well, of course. Good that your Dad liked Horton- such a rugged, skilled defenseman. Keon's one of my all-time favorites. And he was the first "hero" of mine I actually met. It was at Central Neighbourhood House, around Carlton and Sherbourne, back in 1960. When we heard Dave Keon was coming to our Christmas party, we kids couldn't have been more excited. He was a new Leaf at the time, and was an instant favorite. I can still vividly remember shaking his hand, in awe that I was talking to DAVEY KEON!!! I remember how he took care to talk to each of us kids... and make us feel special, as if he was an older brother, almost. I've enshrined that memory as one of the highlights of my life. For some reason, (as documented in Nick Hornby's excellent book, Fever Pitch), and particularly with boys about 12 or so, heroes arrive in our lives, and become an inspiration, you might say. In later life, I've had other heroes, many of whom ultimately proved to be disillusioning. Not so with Dave Keon. He's probably the only player whose lack of "official" Maple Leaf recognition really bothered me - even if his determined stand was a part of that - and it feels as if a monumental wrong has finally been righted. Hurray! Really well said, Gerund O'- and thank you for sharing a vivid memory from more than fifty years ago. No question Keon was a special Leaf. You and I were clearly not alone in following- and remembering - him fondly.